New book, 70 pages. Command and Control (C2) is a critical enabler for all military organisations. In particular, C2 of air power has unique characteristics that reflect the way that professional airmen fly and fight. It is therefore vital that all members of the Royal Australian Air Force, the wider Australian Defence Force and the Department of Defence, understand Air Force’s C2 system. The handbook enunciates the Chief of Air Force's responsibilities to Government and the Chief of the Defence Force, and the processes used to discharge these responsibilities. It identifies CAF’s two principal executives, the Deputy Chief of Air Force (DCAF) and the Air Commander Australia (ACAUST), and the processes and support structures they use to command and control the Air Force on CAF’s behalf. In particular, the roles and responsibilities of ACAUST are detailed because of how the raise, train and sustain aspects of Air Force capabilities are managed so they are ready for operations, and also how ACAUST oversees the Air and Space Operations Centre (AOC), which is force assigned to Chief of Joint Operations (CJOPS). 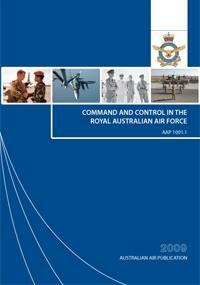 This handbook also defines the terms command, control, leadership and governance, and describes the nature of C2 within the Air Force noting the key and enduring air power C2 tenet of centralised control and decentralised execution. As such, the terms and definitions for C2 used within this handbook are fully synchronised with ADDP 00.1 - Command and Control. Historical vignettes have been included to amplify key elements of Air Force’s C2 mechanism and to illustrate that the C2 framework has evolved over time, incorporating lessons learned from past operations and Air Force’s proud heritage. In this respect, attention is drawn to the historical vignette on RAAF C2 in World War II and the subsequent impact of having an ineffective C2 framework with unclear lines of responsibility. This item was added to our catalog on Sunday 03 January, 2016.